Purchase Frozen Cauliflower Rice from Trader Joe’s (this is what I do.). To make the cauliflower rice, place florets in a food processor fitted with the blade attachment. Process until cauliflower is ground into fine bits that resemble bits of rice or couscous. Place a large skillet over medium heat. Add olive oil. Add the cauliflower bits to the heated pan and toss to combine. Allow to cook until the cauliflower rice has softened slightly and browned, about 6 to 8 minutes. Season generously with salt and pepper. Add any other flavoring, herb, or seasoning you might enjoy. Remove from heat and spoon into two large bowls. If you have any excess rice, store it in the refrigerator for up to 5 days. 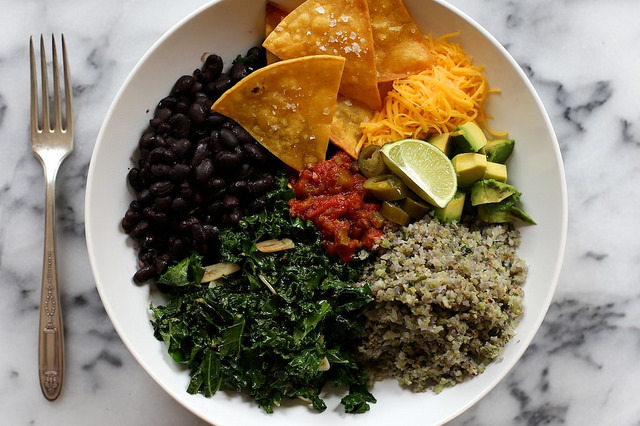 To make a burrito bowl, start with a large shallow bowl or plate. Spoon cauliflower rice onto the plate. Spoon warmed black beans next to the rice. Spoon sautéed kale next to the beans. Top generously with hot salsa, shredded cheese, ripe avocado, pickled jalapeños, fried tortilla chips, and fresh cilantro leaves. Enjoy! From the Blog of Joy the Baker.